Data suggest that cerebrospinal fluid (CSF) neurofilament light chain (NfL) levels can accurately predict future brain volume loss in patients with clinically isolated syndrome (CIS). The study results were presented at the European Committee for Treatment and Research in Multiple Sclerosis (ECTRIMS) Congress in Barcelona. The aim of the study was to evaluate whether CSF NfL levels gathered from clinically isolated syndrome patients are associated with brain volume changes at one and five years. The study included 68 patients — 33 with CIS-CIS and 35 with CIS clinically definite multiple sclerosis (CDMS) — who had at least two years of follow-up and available CSF samples. 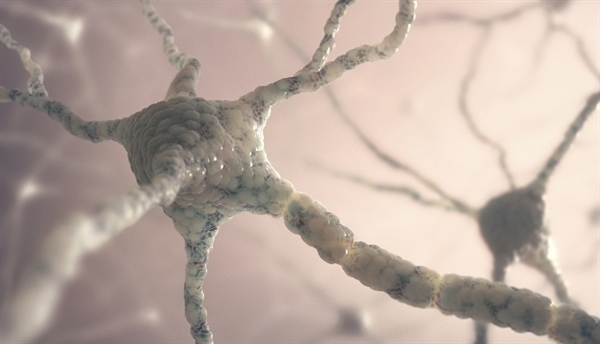 Georgina Arrambide, MD, of the neuroimmunology department at the Multiple Sclerosis Centre of Catalonia, Spain, and colleagues used a sandwich enzyme-linked immunosorbent assay kit to determine NfL levels. Percent brain volume change (PBVC) was calculated among patients with scans of sufficient quality for volumetric analysis, while brain parenchymal fraction change (BPFch) was determined by cross-sectional analyses. After adjusting for age and baseline gadolinium-enhancing lesions, researchers evaluated partial correlations between NfL levels and PBVC/BPFch from baseline to one and five years. Overall, median NfL levels for all patients were 788.6 ng/L, with levels of 262.2 ng/L observed in CIS-CIS patients and 937.6 ng/L in CIS-CDMS patients. Rates of intraplate coefficients of variation were 9.7% compared with 0.5% for interpolate coefficients of variation. Baseline demographic and clinical variables between cases with and without brain volume change information were similar. At one year, BPFch information was available in 29 patients and PBVC was estimated in 26 patients, whereas at five years BPFch was available in 17 patients and PBVC estimated in 14 patients. According to results, one-year partial correlations with NfL levels were –0.558 (P=.001) for BPFch and –0.345 (P=.072) for PBVC; while five-year correlations with BPFch were –0.892 (P<.0001) and –0.842 for PBVC (P<.0001). “Our results support the value of CSF NfL levels as a predictor of future brain volume loss in CIS patients and warrant confirmation in larger, consecutive patient cohorts,” Dr. Arrambide and colleagues concluded. Arrambide G et al. Abstract 138. Presented at: The European Committee for Treatment and Research in Multiple Sclerosis (ECTRIMS) Congress; Oct. 7-10, 2015; Barcelona.